Just when I thought my favorite kicks couldn’t get any cooler, I was walking through Nordstrom and spotted perhaps the coolest Converse All Stars ever, which were crafted with Missoni fabrics. 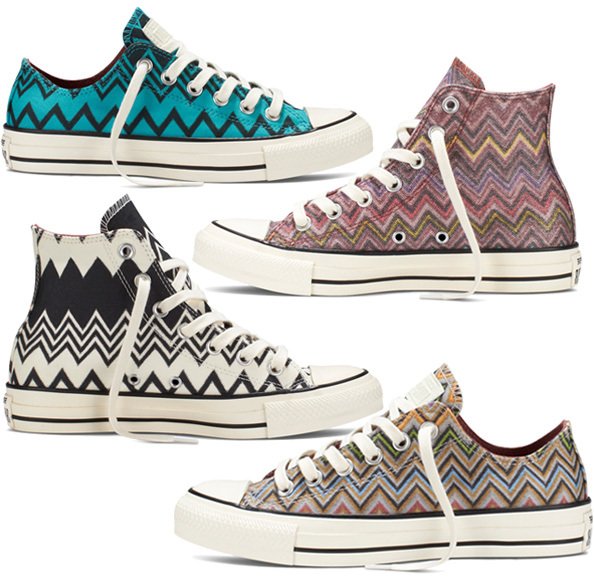 High tops, low sneaks, classic and vintage designs all decked out with the fashion house’s glittery, colorful chevron? Pretty much my dream shoes. The cool collaboration (which is apparently the 9th time both brands have worked together, how did I not know about this until now?!) fuses the luxury of Missoni with the ease and comfy wearability of Chuck Taylors, and the shoes are glamorous enough that you can pair them with fancier outfits and even your work clothes if you work in a laid-back atmosphere like I do. Each pair of the limited edition Nordstrom exclusives runs from about $70-$100 which is both a horribly expensive price for Chucks and an insanely cheap bargain for anything with a Missoni label. Let us know if you’re one of the lucky few who have snapped up a pair! These sneakers, or are they, are fab!